Karen Dalton has become one of my favourite musicians in the past six months. Her name was mentioned to me a few years ago and i scribbled it down in a notebook. It was only when i cleaned out a box of paperwork and found the notebook that i decided to find some of her music. Dalton is a forgotten treasure of American music, she was a blues singer and a banjo player who was associated with the 1960's Greenwich Village music scene. She also played the 12 string guitar. Blessed with a distinctive throaty voice she has been compared by some to Billie Holiday (Dalton apparently hated the comparison). There is something in her voice that just cuts right through my heart. Born in Oklahoma of Cherokee heritage she moved to New York in the early 60's. In Chronicles Bob Dylan recalls her as "funky, lanky and sultry". 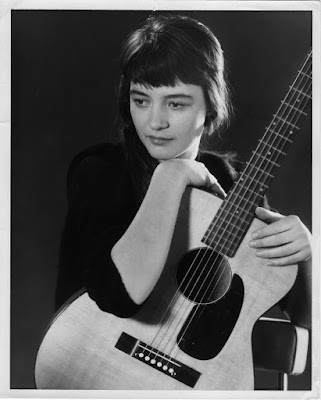 "My favorite singer in the place was Karen Dalton. Karen had a voice like Billie Holiday's and played the guitar like Jimmy Reed." Her records were not commercially successful. She was uncomfortable playing live and also with recording. In order for Fred Neil to catch any of her music he had to lie and pretend that he wasn't recording. Dalton released 2 albums whilst she was alive: 'It's So Hard to Tell Who's Going to Love You the Best' and 'In My Own Time'. Dalton had a painful past (a failed marriage and eventual estrangement from her children) and this may have fueled her addiction to alcohol and drugs. After she made 2 albums she removed herself from her old life and became heavily involved with using heroin and other drugs. Eventually she spent time on the streets and crashing where she could. She died in New York in 1993. The cause of death was from drug abuse and an AID's related illness. God, that's a great voice, you're doing good work there lady! Wow her voice is amazing. Very distinctive. Nice discovery, thanks! Wonder why it's always the tortured types that make such great music? !